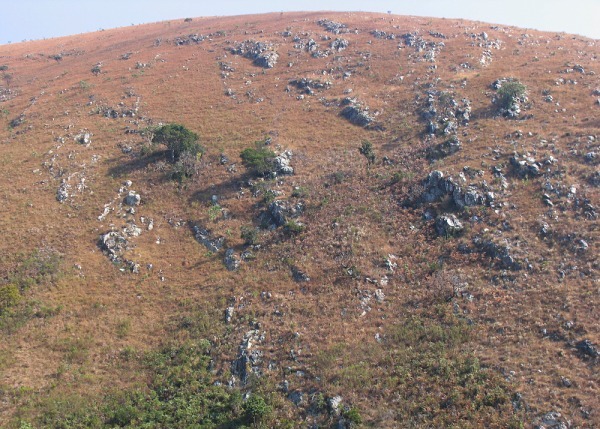 Stanford geology professor Donald Lowe has been haunting the ancient hills of South Africa for a long time. In the 1980s, he first found evidence in the Barberton greenstone beltlocated east of Johannesburgof enormous events that occurred there more than 3 billion years ago during the Archean Eon. There were networks of large cracks in solid rocks that had sucked the overlying sediment (now turned to chert) down into them. There were signs of great tsunamis that had torn up the seafloor and strewn its pieces far and wide. Most telling were layers of sand-size droplets of formerly molten rock—spherules—with the chemistry of extraterrestrial material. Lowe put the evidence together into a story of asteroid collisions, like the one that killed off most of the dinosaurs 65 million years ago in the Cretaceous Period, only much bigger. Whereas the Cretaceous impactor was about 10 kilometers across, the Archean one was more like 45 km. Lowe has documented his findings in a series of major papers. In his latest one, just published in the journal Geochemistry, Geophysics, Geosystems, he teamed up with Stanford physicist Norm Sleep to attack the problem from the other direction. Instead of using field evidence to infer the asteroid collision, they applied the raw physics of great impacts on solid bodies to predict what the actual geology might look like after that asteroid collision. After 50 years of interplanetary research, we're pretty sure of what giant impacts do around the solar system. It's just a matter of finding the right equations, feeding them the right numbers and cranking out the astounding answers. Norm Sleep is good at that kind of thing, being a major contributor to a wide variety of early-Earth studies. Their paper is the first to go from the cosmic scale of model impacts all the way down to the sediment-sucking cracks and spherule beds of the Barberton greenstone belt in plausible detail—a visualization of the unimaginable. A 45-km asteroid is big enough to make a crater the size of the great dark maria on the Moon's surface. On Earth, the resulting crater would have been roughly 500 km across (think of San Francisco on one edge and Los Angeles on the other). At the time, about 3.26 billion years ago, the Barberton belt was apparently a submarine volcanic plateau covered in shallow water, something like the Kerguelen archipelago of the southern Indian Ocean. It was not at the actual impact site but at least several thousand kilometers away. Any closer and all evidence would have been wiped out entirely, but it could have been anywhere else on Earth because the effects must have been global. Here's what Sleep and Lowe figure happened. First, "extreme seismic waves" literally shattered the Earth's crust within a couple of hours, shaking the ground continuously for tens of minutes. The sediments lying on the crust turned to liquid. On the magnitude scale of earthquakes, this would have rated approximately 10.8 (that's for a 30-km impactor, so we could say that a 45-km one truly would "go up to 11"). Mountains would literally have crumbled in massive slumping landslides, opening spreading-related cracks called sackungen. 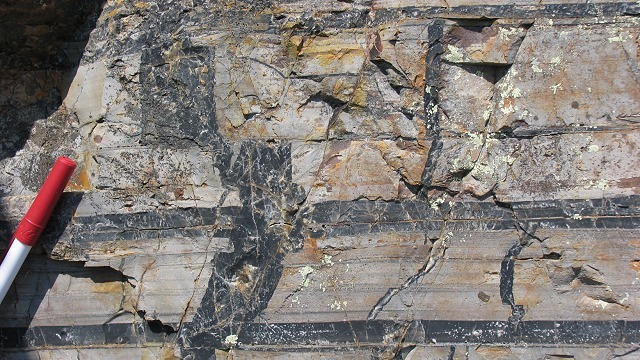 At Barberton, pervasive sediment-filled cracks formed in the volcanic rocks, like those seen in the outcrops. While this was happening, the cratering produced a global cloud of vaporized rock, half from the impactor and half from Earth. This cloud condensed into a universal rain of red-hot grit that would have quickly carpeted the whole world, even while the shaking was going on. That's how the spherules were sucked down into the cracks along with the sediment they lay upon. Then the tsunamis arrived, washing over everything early near the impact and later farther away. The precise location matters for the timing of this part. Sleep and Lowe's model assumed, for the sake of calculations, that Barberton was about 5000 km away. The results were consistent enough with the field evidence to be worth publishing. But their modeling method could be used to give insight whenever new Archean spherule localities are found (so far we've only looked thoroughly at the Kaapvaal craton, where Barberton sits, and the 2.5-billion-year-old Pilbara craton in Australia). There are two larger problems in Earth history on which this paper may shed light. One is that we aren't sure when the constant flood of large asteroid impacts ended. For a while it looked like the "Late Heavy Bombardment" ended abruptly around 3.8 billion years ago, but the Archean spherule layers (there are seven in Barberton alone) suggest that the bombardment tailed off more gradually. This is important, as you might imagine, for the history of life. The other problem is how and when plate tectonics began on Earth. Raw physics doesn't predict an inevitable progression to plate tectonics, and there's almost no geological evidence that everyone agrees on. Late Archean impacts, Sleep and Lowe suggest, could have kick-started the circulation of the crust that keeps our world of drifting continents the way it is today.